W elcome! Well, this is my next series of Zelda tales. It's set seven years after the previous Battle For Power trilogy, and sets out to answer some of the questions that remained unknown at the end of the last series. 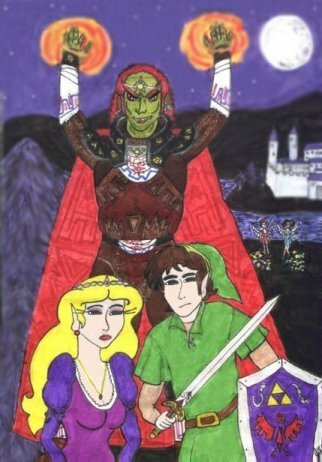 This is the second book in the new trilogy (5th in the entire series), and we see our favourite hero and his friends go into a fully-fledged war against Ganondorf, and his newly acquired dark forces of evil - the Tanolians and the Gerudos. His main aim is of course, to take the Triforce. Even if the Hyrulian Army are successful in keeping the enemy at bay, Ganondorf already has several other tricks up his sleeve, which will ensure his success... Link and Zelda are going to need all the help they can get, if they're going to save the kingdom from this oncoming catastrophe. Hyrule has gone to war against Ganondorf! The newly transformed Gerudo King has built up his army, becoming an ally with Hyrule's long-term nemesis, Lord Canivaris of Tanol, and begun to attack Hyrule. Link and the rest must do their best to stop Ganondorf from getting close to the castle, else he could take the Triforce and be that one step closer to his ambition of ruling the whole of Demiari. In a dramatic climax, Link and Ganondorf will prepare for the final face-to-face battle, from which only one will escape alive. Even with the power of the past on his side, will Link be to one to survive?